Millions of adults suffer from the incurable disease multiple sclerosis (MS). It is relatively certain that MS is an autoimmune disease in which the body's own defense cells attack the myelin in the brain and spinal cord. 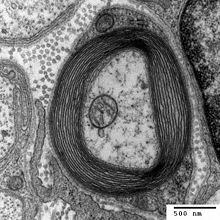 Myelin enwraps the nerve cells and is important for their function of transmitting stimuli as electrical signals. There are numerous unconfirmed hypotheses on the development of MS, one of which has now been refuted by the neuroimmunologists in their current research: The death of oligodendrocytes, as the cells that produce the myelin sheath are called, does not trigger MS. With their research, published February 26, 2012 in Nature Neuroscience, the scientists disprove the so-called "neurodegenerative hypothesis," which was based on observations that certain patients exhibited characteristic myelin damage without a discernable immune attack. In the popular hypothesis, the scientists assume that MS-triggering myelin damage occurs without the involvement of the immune system. In this scenario, the immune response against myelin would be the result – and not the cause – of this pathogenic process. The aim of the current research project was to confirm or disprove this hypothesis based on a new mouse model. Using genetic tricks, the researchers induced myelin defects without alerting the immune defense. "At the beginning of our study, we found myelin damage that strongly resembled the previous observations in MS patients," explains Dr. Burkhard Becher, a professor at the University of Zurich. "However, not once were we able to observe an MS-like autoimmune disease." In order to ascertain whether an active immune defense causes the disease based on a combination of an infection and myelin damage, the researchers conducted a variety of further experiments – without success.